The service offering of the renowned Max's Lifestyle in Umlazi has expanded. 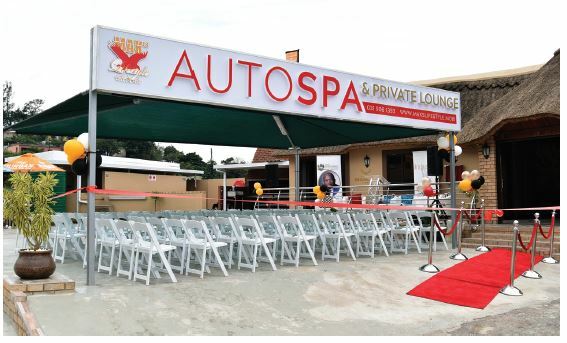 In April 2017 MEC Sihle Zikalala, along with other senior representatives of eThekwini Municipality and Umlazi, cut the red ribbon at the launch of the new auto spa and private lounge that adjoins the restaurant. Max's Lifestyle offers its clientele 'shisa nyama' (cooked meat), a variety of traditional side dishes, as well as traditional 'kasie' (ethnic township location) music and culture. Max Mqadi is the name behind Max's Lifestyle and he is considered one of Umlazi's 'own'. Mqadi is an entrepreneur who has built a highly successful international brand, which attracts tourists from all over the world. Often the first question that visitors to the Province of KwaZulu-Natal ask is, "Where is Max's". In 2016, Max Lifestyle was selected as one of the top 207 restaurants in the world by Conde Naste magazine. More recently, Mqadi saw an opportunity to provide additional services to guests, who can now enjoy a meal, relax with friends in the VIP lounge, attend an event and have their car washed. Said Mqadi, "Very often people only talk about what they wish to achieve but don't implement their plans." Mr Zikalala said that in the past South African policies ensured that townships have not enjoyed a good reputation. Historically they were the places where black people were forced to live in order to be close to economic hubs and greatly illustrated a lack of spatial planning. Since 1994, townships have been rejuvenated and are seeing ongoing development. Of significance, the opportunities provided by a democratic environment have made it easier to develop and market establishments such as Max's. Said Maqdi, "I wanted to change the face of the township and I feel like saying I did it! Here blacks are benefitting. An entrepreneur is running a successful establishment, which has participated in changing the perceptions of Umlazi. Certainly, the residents of Umlazi are very proud of Max's Lifestyle's achievements and support the restaurant, which also brings additional economic benefits to the township in terms of employment opportunities. In this regard Mqadi has been a pioneer and made it easy to market Umlazi as it has been put on the map. The township has also had to deal with misconceptions and fears in order to move forward as a tourist destination. Max's Lifestyle keeps dispelling such attitudes as having centres of excellence ensures that this job is easier. Mr Zikalala said Max's Lifestyle is an ambassador for progress and achievement. However, he added that townships are not only about entertainment and fun. Development provides the opportunity to preserve the culture and history of Umlazi as well as the people who lived there and educate our children about our past through the establishment of township museums. Many well know local celebrities, sportspersons and politicians are to be found unwinding here. Max's is known as the place to be for big post-event parties such as the annual Vodacom Durban July horse race party and post Metro FM Awards. Max's is a very popular venue for year-end functions, baby showers and product launches. "The common goal is to have a good time, feel the warmth, and to become a part of Max's Lifestyle family," said manager Tarnia Lekhooane. The general view is that more local tourists need to be encouraged to visit Max's Lifestyle. "Max's provide a platform to welcome all people to promote cultural exchanges and celebrate diversity, which brings our rainbow nation together," said Zikalala. Said Mqadi, "Max's Lifestyle is a disciplined space. I like to be an entrepreneur but I also comply with all government requirements and legislation. I have a licence to operate. The restaurant is a safe place to let loose and enjoy the township vibe. Part of developing townships is to fight crime, to ensure cleanliness and to provide proper services in order to promote the respect of people." Mqadi added that part of his success has been built on partnerships. "I had a vision and would like to thank those entities such as Durban Tourism who supported me in my achievements. My future dream is to develop a boutique hotel in the township. If you want to look for radical economic transformation go and visit Max's and you will see what freedom is. I want to support my government in uniting people and ensuring that we have respect for each other. I need to say don't be shy to give a black man a chance, he deserves it!" he concluded. Services / Products: Max's Lifestyle specialises in conferences and can accommodate around 200 patrons in an amazing environment. Weddings, 21st Birthday Parties, Staff parties and business conferences can all be catered for. Large tourist groups are welcome too. The VIP area has amazing views of Umlazi and offers a special experience on the expansive deck overlooking the township.